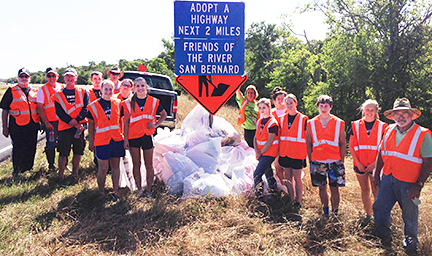 FOR San Bernard hosted a trash collection on Saturday, May 17, 2014 on two miles of FM 2611, before and after the Churchill Bridge. Nineteen volunteers participated in the quarterly Adopt-A-Highway program. Fifty (50) bags of trash were collected. A special thanks to Constable Fred Kanter for providing road safety and to the Sweeny High School Interact Club who had seven students participate along with their sponsors, Colleen Knight, Sweeny High School and Jim Alford, Sweeny Rotary. Because of the location next to the Churchill bridge boat ramp and fishing dock, this section of FM 2611 gets alot of rubbish that washes into the river during a heavy rain. Picking up trash helps keeps the river clean and healthy!